Each year around this time, we’re faced with what we call a ‘doomsday’ event within the office; where dozens of our camera, lenses and other gear arrive back from rental orders, destroyed by the environment. And while our customer base is amazing, and often accept their repairs and replacement costs to the destroyed gear, each year, the same thing happens. So this year, we decided to take a different approach, and plea – Please don’t bring our camera gear to Burning Man. Burning Man is an annual event and art installation that takes place each year in the deserts of Nevada. With over 60,000 people in attendance each year, Burning Man has become one of the most popular events among creatives, looking to find inspiration in their work. It has also been a favorite place where people look to document the experience, and as a result, come home with destroyed cameras and lenses. Despite the warnings from articles scattered around the internet, as well as warnings from Burning Man themselves, people each year attempt to take camera equipment to Burning Man. 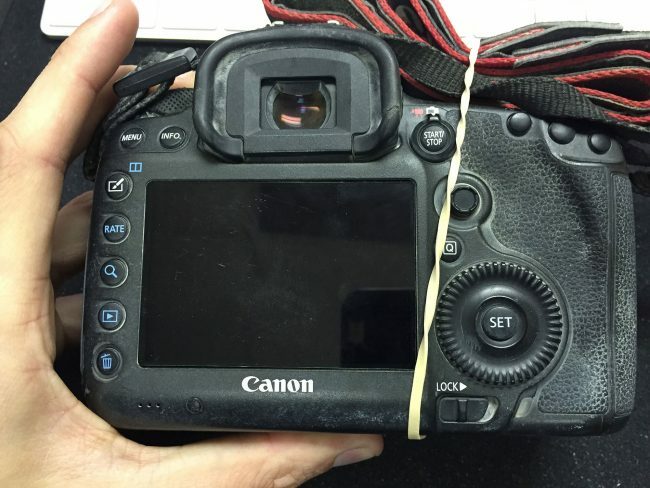 Many will prep, covering their cameras with gaff tape, plastic bags, and filters, but there is no failsafe to the damage that can be done to cameras and lenses alike. Events like Burning Man are why we have a neglect clause within our rental agreement, though each year, we do have a few pieces of gear that have obviously arrived back from Burning Man. We have a talented repair department, and these things happen, but we wanted to share with you why Burning Man, in particular, is so rough on equipment. One would think that the biggest concern when going to Burning Man would be the sand from the desert in which it is held. 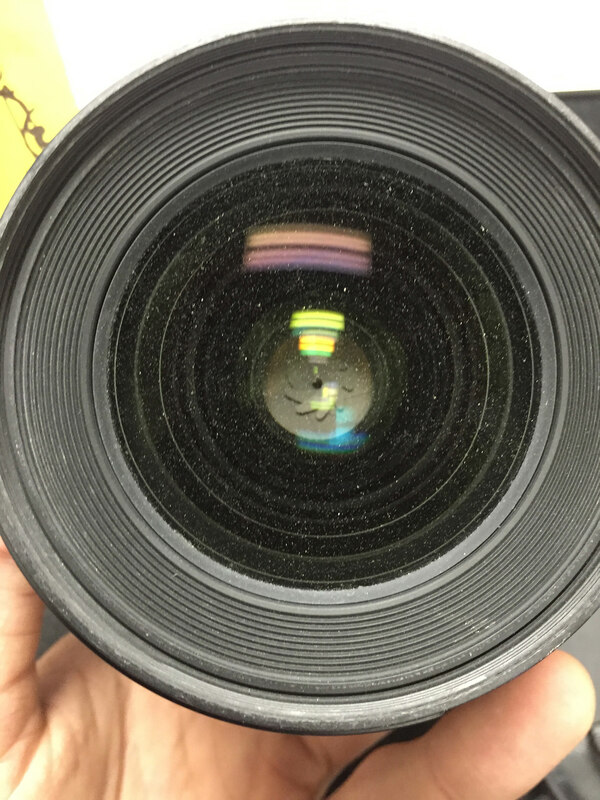 While the sand is a menace and will jam up a zoom lens in no time, the biggest concern is actually the dust. One of the more interesting phenomena that happen during Burning Man are the dust storms. Thes dust storms occur erratically and with little warning, kicking up the fine dust buried within the sand and quickly causes damage to your electronics, your skin, and your lungs. But dust storms aren’t the only potential damage your camera might endure; you also run into water damage – or more particularly, sweat damage. Last year, temperatures at Burning Man were over 100°F (38°C). This level of heat causes people to sweat, and when you’re sweating with a camera hanging around your neck all day, some of that sweat is bound to get into the internals of the camera. As we’ve talked about before – water isn’t good for electronics, but what is the real killer is the impurities within the water – and in particular, salt. Salt builds up on electronics, is a conductor of electricity, and will fry electronics in no time. A topic Roger discussed last year with his Sony a7sII Teardown. While it’s easy to heed a warning, it’s much more effective when we put together a few examples. So here are some of the returns we’ve seen from Burning Man in previous years. I know what you’re thinking, the Canon 1DX Mark II is the camera choice for the Nat Geo photographers climbing to the summits of Everest, and the cameras that are snapping photos in front of photojournalists travel to war ravished cities. But while the Canon 1DX Mark II is built for abuse, it doesn’t mean it’s impenetrable to that abuse. 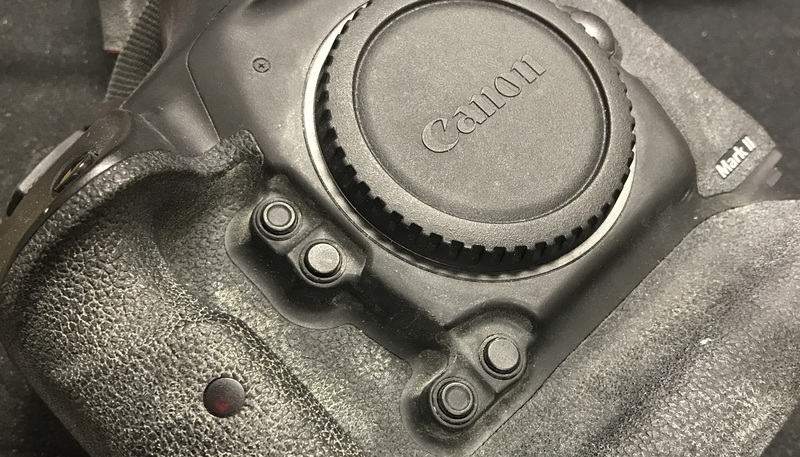 This Canon 1DX Mark II was sent back to us after a Burning Man trip, and needed a full inspection and cleaning from Canon. The cost was a few hundred dollars, but despite claims of ‘weatherproof’, the dust still found its way into the camera system. You may recognize this Nikon D810 from a post Roger did a couple years ago, where he needed to take it apart for cleaning and inspection. Not only was the outside of the camera caked in dust and dirt, but the insides of it were as well. After a full teardown and cleaning the camera was able to pass all of the tests and make its way back into the rental program. But not without a couple hundred dollars being charged to the customer for the servicing. 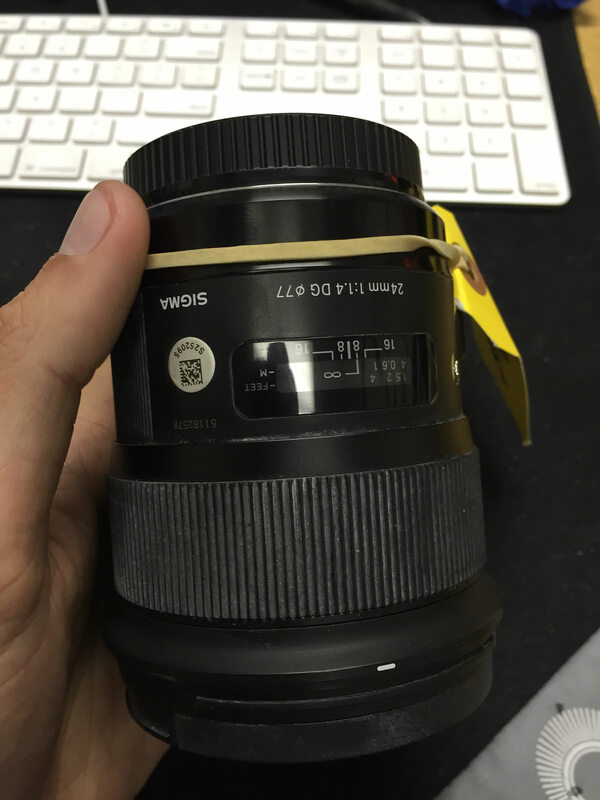 This Sigma 24mm Art Series came back to us a few days after Burning Man and had some of the dust to prove it. Repairs on the lens included a full replacement of the housing and lens grouping directly from Sigma, bringing the damage to $235. 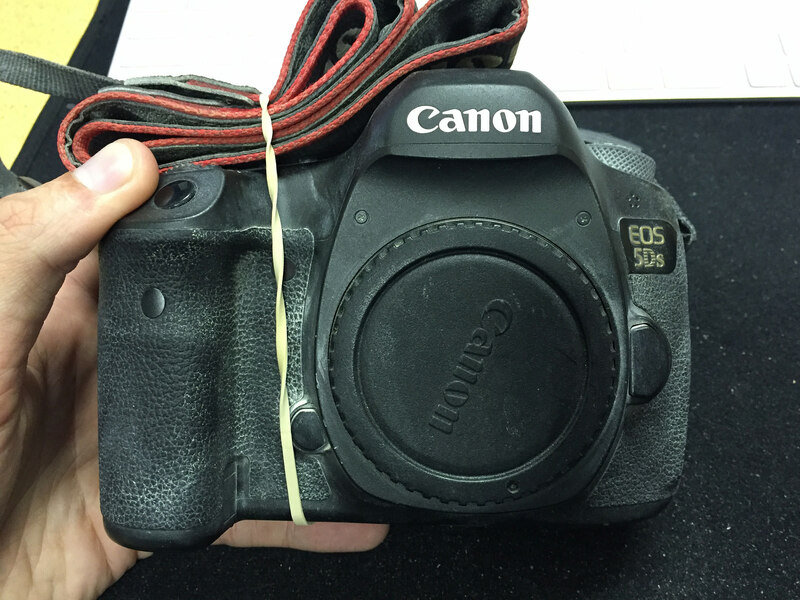 This Canon 5Ds came back and required a full cleaning from our repair department. The process is long and tedious and resulted in over an hour of disassembling and cleaning of the insides and out. 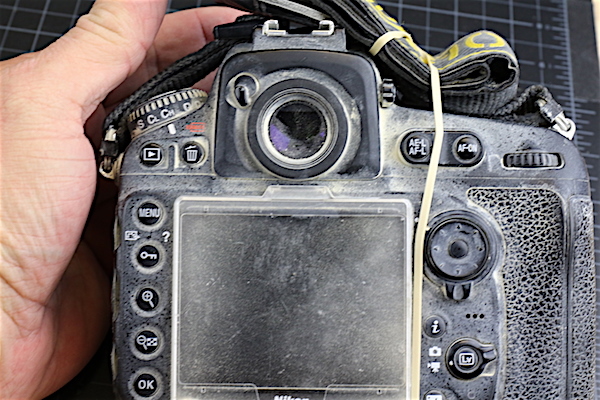 If you do take a camera to Burning Man, please know and accept it will be damaged by the event. For every one of the “My friend Steve brought his camera and it was fine” stories, ten stories end in heartbreak. While many blogs may follow up the damage with tips on how to better weather seal your camera, we’re a little more cynical. With an entire repair department working on thousands of pieces of gear, we’ve learned that weather-sealing is a bit of a marketing tool, and not really indicative of any real standardized meaning. And while plastic bags, waterproof kits, and gaff tape may help, it isn’t a failproof solution, so our best alternative for you is to just purchase what you need for Burning Man, and recognize the risk. This also gives us the proper segue to recommend our sister site, Lens Authority. Lens Authority is a used marketplace where all the gear is inspected, cleaned and then rated on an easy to understand scale. This is where our rental equipment usually ends up after a few months in the system. You’re able to get well maintained and inspected gear, at a fraction of their new cost. 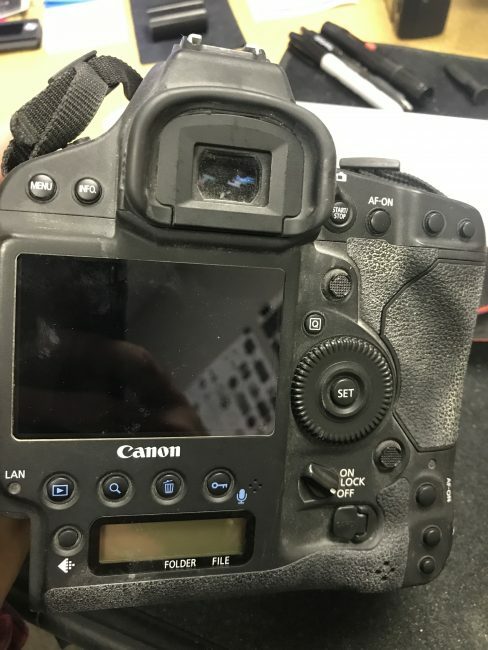 We recognize that sometimes mistakes happen, and try to make these posts be in good light, while also making you ill with our photos of damaged equipment. If you do damage the gear rented from us, that’s not a problem. Just send it back, and we’ll contact you when it is received, with a repair cost. Our repair department is highly skilled and always preferred over people trying to fix it themselves before sending back. Damaged gear happens, which is why we offer insurance solutions like LensCap. And while our insurance system is excellent, it doesn’t cover neglect like that shown above. Do you have some gear you brought along with you to Burning Man? Share some photos and your stories in the comments below. I think part of the problem is that unlike phones, which are a single entity/unit, a DSLR consists of a system including a body, lens, and accessory. So the IP rating doesn’t mean anything if for example, the camera itself is technically a IP6x but with a non-rated lens and battery grip. I’ve been shooting a Nikon D90 for the past few years and have over 200k actuations on it, been drenched by rogue waves, pouring rain, snow, sleet and hail, shot in temps over a hundred and well under freezing, spent 100’s of hours shooting kite surfing on beaches and as many hours shooting on the line at various raceways but, after seeing those photos of gear after Burning Man, I’d seriously consider F. Lee’s suggestion about buying something cheap and leave the ‘workhorse’ at home. Definition of pedantic. 1 : of, relating to, or being a pedant a pedantic teacher. 2 : narrowly, stodgily, and often ostentatiously learned a pedantic insistence that we follow the rules exactly. 3 : unimaginative, dull. Yup… that’s what you’re being. Comes dangerously close to “jerk” from my perspective. Digital cameras are “mostly” overrated for the burn unless your producing images for Taschen or the like. Instead, take a holga, or the like, along with plenty of film and HAVE FUN with it! Then again, LR will see the damage anyway, and Burners do have a reputation to be nice people (can’t personally confirm since I don’t know any…) so if hey asked nicely, they might get a reasonably accurate number? If (IFF!) 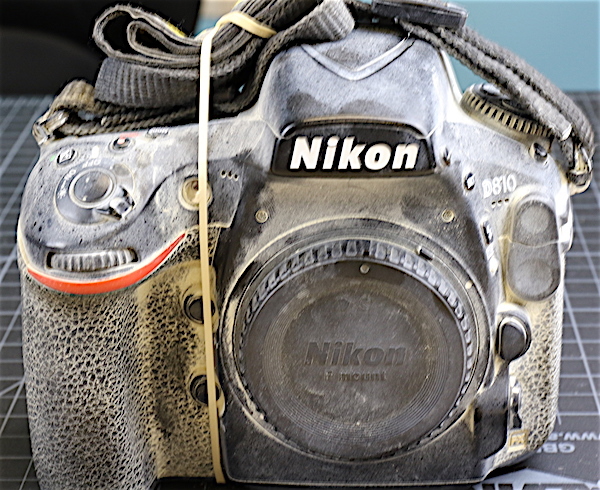 this works, it might actually become a pretty useful field test for cameras’ dust protection, and I’d certainly love to see the numbers, as well as any useful tips for how to protect your gear. Are you sure it’s not squeegee? What is your definition of sand? That’s a pretty generalized statement. Really it only takes a few renters treating gear badly to give the group a bad name. When I’ve taken rented gear to Burning Man, I returned it in as good condition as it was given to me, and I know plenty of photographers who do the same. Unfortunately we can no longer say we are taking rented gear to the event, because of a few bad apples who don’t give a damn about rented gear. These are the same renters who will treat gear poorly no matter where they go. Just got back from Burning Man. Took lots of pictures, even in the dust storms. My trusty old 60D still works just fine; only a bit of dust on the sensor. (I should have tapped over a couple of spots) None of my lenses have dust inside. All it takes is a little care and keeping your gear off the ground, and in a bag when not in use. Hi Bob. I never said the dust wasn’t the problem. My only comment was that the mention of sand was unnecessary because there is no sand in the black rock desert. I’m not sure what you mean by “athoratative aire”. Is there a problem with wanting to use first hand knowledge to correct a misconception? Brought my old Pentax K200D, a WR “kit zoom”, and an old Sigma 2.8/28-70mm that could take a beating because it was already in not so great condition. The clean-up of the Sigma, including a new focusing sleeve that got out of whack, took about 100 euros. Now the lens work better than before 🙂 It needed to be cleaned because I took a lo of pictures of a wedding out on the playa, and the wind was blowing. I didn’t use any special protection for he camera, just simple common sense. I guess it confirms that Pentax cameras have a long history of robust, weather resistant build. I had just bought the newly released K-1 in the States, coming from Italy, but i didn’t have the balls to take it with me, cause I had no full frame WR lenses. There are places where the enemy is far more discreet than at Burning Man, but as dangerous. Possibly even more. Playa silt is evident enough to to call for countermeasures. Well, if one really need pictures at the Burning Man, how about an old Canon 20D/30D, with a current 18-55 STM Kitlens (F4-5.6)? I’d be also worse, even this cheap gear to get broken, but at least, it’s way cheaper than a FF DSLR…. I do use this combo on “unsave” locations, when taking pictures, and both are like into mint condition. About the Hotshoe Issue – i have no weather sealed DSLR, but i put always a hotshoe cover onto it, to avoid dust, sand, corrosion, dirt onto it. It helps, and it does cost only a few cent. This is just what i was thinking… would love to rent or buy gear and only pay a couple hundred to repair or clean it after the burn! Hopefully this carefully illustrated warning will have the desired effect. But it might do the opposite. Nowhere else could or would clean those cameras and lenses back to working condition for so reasonable a price as mentioned in the post. If someone takes their own lenses and camera to burning man they are going to have to pay way more to get them back to spec, if they can even find someone willing to do the work rather than just declare the equipment totaled upon looking at it. Just as a side note: It’s much more difficult to seal against dust than against water because of the surface tension respectively the lack thereof. So a waterproof case isn’t necessarily also dustproof. Regarding the statement, “we’ve learned that weather-sealing is a bit of a marketing tool, and not really indicative of any real standardized meaning.” I’ve always wondered why camera makers won’t use objective environmental protection designations. My career is in industrial sensors and controls, and environmental protection of industrial sensors and electronics is often critical. The “IP” standards for Ingress Protection are widely used internationally. For example, a device rated IP65 is dust tight and will withstand water spray from a nozzle. An IP67-rated device is also dust tight and will withstand immersion in up to one meter of water for up to 30 minutes. Each rating is very objective with measurable performance parameters. Now there may be valid reasons why the IP rating system is inappropriate for consumer gear, but I don’t know what they might be. Adoption of objective ratings would obviate a lot of the subjective statements about weather sealing and provide valuable guidance. what about using a underwater cage, that shoud be quite effective against dust. Some type of underwater housing would work. You’d use the same strategy as the Holi festival in India which features powders and water. My old Nikonos would lough the dust problem off. James: the author of the article was VERY clear that the dust is the problem. …and your “athoratative aire” is also part of the problem. Lens Rental: Can you give us helpful pointers to prontect our gear in this environment. Protective bags, aftermarket gear, home remedies…I am looking for creative solutions with an open mind that the camera, my cameras are my responsibility in this environment. Some of us aspire to shoot there. We just have to! I spent a week in nearby Paria Canyon which also generates fine red dust and the kit zoom on our Canon Rebel got pretty crunchy but it lived. I definitely would never ever change lenses out there though. That trip was in April and I’m still finding red dust in boots, clothes, and equipment. A smart friend bought cheap SLR and lenses and shot film that week. Wise man. I’ve been 4 times, and my weapon of choice is now a Canon s95 in an underwater enclosure. You can get them for cheap online. (S120 even newer/better). There is no way to take a full size DSLR and not have it get inundated if you get caught in a whiteout dust storm. And you will get caught in one. I made a point of only taking the camera out every other day so I could stay in the moment. Sure, I get that, but the size of dust grains is massively larger than water molecules, and dust is usually subject to much lower pressures than water, meaning that just the normal rubber seal, depressurized, should be able to keep them away. Short of opening the housing without hosing it down first (BAD idea), I don’t see how dust would get inside. 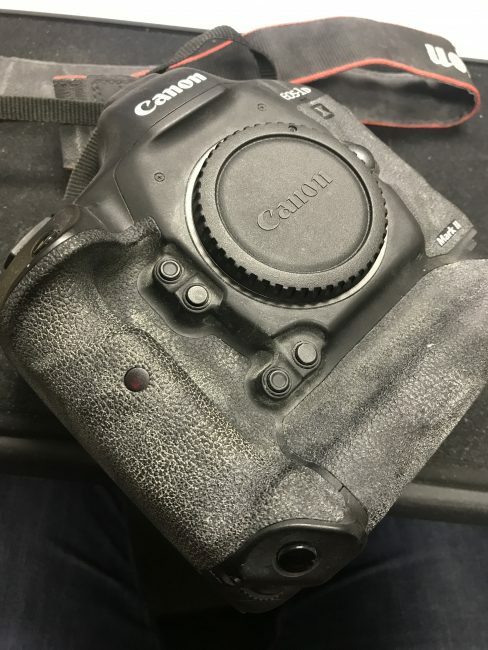 In my experience, all you need to do is keep your camera in a good camera bag with double layered closures when you’re not using it, and clean the outside of your gear daily. Also only use one lens if possible. If you need to change lenses, do it in an enclosure, or only when the wind has died down. Following these rules I’ve only had dust on my sensor once at Burning Man. Implying that I hadn’t even read a post that I was commenting on was pretty offensive, like an attack on my intelligence. Like I said, I’ve been going to the event for almost 20 years now, and there is no sand at Burning Man. The event is held in the middle of a dry glacial lake bed. There is fine alkali dust and small black rocks (which the desert is named after). No sand.